This psalter was made in Ireland (Armagh? ), probably in the late 12th century to judge from the style of the script. The scribe signed his name on one of its pages: 'Cormacus wrote this psalter: pray for him'. 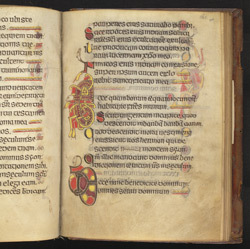 Its decoration shares some features of manuscripts from Armagh, but it combines stylistic elements seen in 8th- and 9th-century illumination (in masterpieces such as the Book of Kells) with current styles. Containing canticles or verse passages from the Bible, such as Deut. 32:1-43, as well as the Book of Psalms, it was used as a prayerbook or hymnal in church services. Two short psalms begin on this page: Psalm 132 (133) (Ecce quam bonum, 'How good and pleasant it is') and 133 (134) (Ecce nunc benedicite dominum, 'Praise the Lord'). While most of the other Psalms in this book have been given allegorical titles, they have been omitted on this page. The blank line above Psalm 132 is noticeable. Although initial letters still take the form of exotic, brilliantly coloured animals with enormous protruding tongues and feet, the decoration also differs from that seen in most of the book. It appears incomplete in its minimal use of yellow cord interlace. Perhaps the titles, which were written in red or multi-coloured, and decoration at the end of the book were never finished.